This property is a nature lover's dream. You can walk down one of the trails and see different wildlife. It is a quiet and serene place to stay. 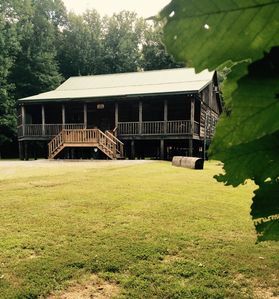 If you love wood, you will truly enjoy being at the cabin as it is built out of Western Kentucky woods including poplar, red oak, white oak, walnut, cherry, sassafras, and coffee tree. If you are a hunter, you might come during one of the hunting seasons and hunt deer or turkey. If you are a quilter, you might want to come during the international quilt show held in nearby Paducah. The cabin is also a great business meeting place, as it is equipped with technology for small meeting groups. Kentucky and Barkley Lakes are located within 25 miles of the cabin. We have a loft with 7 twin beds, a bedroom with one queen bed, and another bedroom with one king bed. Screened-in porches with wooden rockers and two porch swings complement the overall nature experience.